Today, BMW is one of the ten biggest car brands in the world, but did you know that BMW started off manufacturing aircraft engines? BMW was first established in 1916, and after a restructuring of the Rapp Motorenwerke aircraft firm in 1917, the company became a business entity. The first engine created by the company was the BMW IIIa – an inline-six engine that was produced in 1918; the engine was known at the time for its fast and reliable performance. BMW had to stop aircraft engine production at the end of World War I because of the terms set out in the Versailles Armistice Treaty. Because of this, the company shifted focus and started to manufacture motorcycles, and their restrictions were lifted in 1923. The company started to produce cars in 1928, and the first vehicle successfully manufactured by BMW was the Dixi – based on the Austin 7 and granted permission by the Austin Motor Company in the British city of Birmingham. In 1929, Ernst Henne achieved a world record for the fastest motorcycle speed (134 miles per hour) on a vehicle created by BMW, and four years later, the company had created their first car which was powered by a 1.2-liter six-cylinder engine – the BMW 303. Once again, the company started to produce aircraft engines for the Luftwaffe in the 1930s and created many famous World War II designs. Some of these included the BMW 801 and BMW 132 – both of which comprised of air-cooled engines – as well as the BMW 003, which was used to power the Heinkel He 162 Spatz, the powerful aircraft known as the “emergency fighter” in 1944 and 1945. 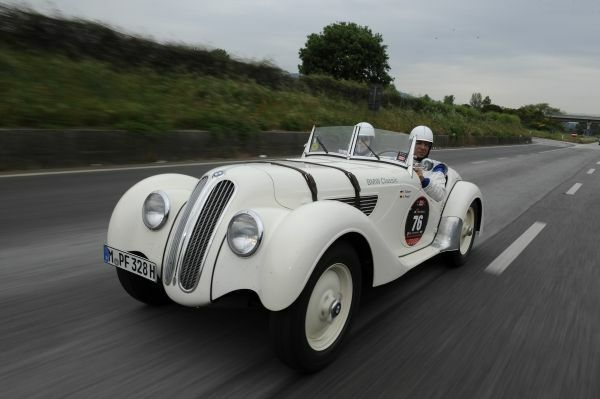 To read more about how BMW was turned from a small aircraft engine manufacturer, into one of the greatest car brands on Earth, you can read the full history of the company on BMW’s official site here: BMW Group – company history.